We have experience in assisting HOAs, parks, developers, builders, city planners and more. Why do clients return to us time and again to service their pond or lake? Our commercial and municipal clients trust us to do a first-rate job at a fair price. Eternally Green Pond Management can also provide consulting, upon request. 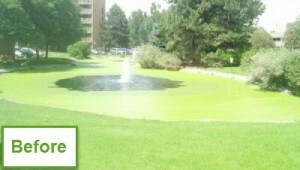 Over our years as an industry leader in the pond and lake management services industry, Eternally Green Pond Management has worked with countless commercial and municipal property owners and managers to stay on top of their aquatic needs by addressing the various issues that arise in a pond. Controlling and managing the growth of vegetation in your pond or water garden is critical to maintaining a clean, healthy ecosystem in-and-around your water feature. If allowed to thrive, algae and other fungi, along with weeds, can take over quickly, making life difficult for your koi, game fish or sterile grass carp and creating an unsightly mess. Along with our other water feature services, Eternally Green Pond Management also provides vegetation control for ponds and water gardens. Eternally Green Pond Management is certified by the Illinois Department of Agriculture, and we maintain an aquatic pesticide license. This certification requires extensive training, testing and ongoing certification. Our experts are adept at identifying all kinds of weeds and algae, and we can use that knowledge to more accurately kill weeds in your pond quickly and without harming the ecosystem and the stocked fish and amphibians living in it. We offer these services on a monthly basis, or single at-need services. Call or email us to discuss your individual needs. We can create a custom solution that fits your needs and your budget. 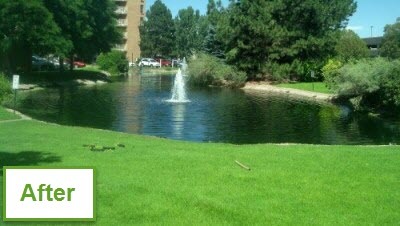 Don’t wait, a clean, healthy, vibrant pond is within reach, contact us today.